Rawalpindi was a Mughal base that developed into a trading centre by the Sikhs in the 19th century. 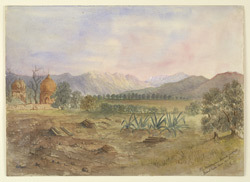 The British gained control over it after the Second Anglo-Sikh War in 1849, and made it their Army Headquarters for the northern region. It developed into an important cantonment with good connections with other parts of India when the railways were extended. This, and its position on the Grand Trunk Road, meant that the town developed both in size and importance throughout the century.